When you get to that point that you feel consumed by the things piling up around you, it’s tough not to feel overwhelmed when you don’t even know where to begin. It can all feel so hopeless and so overwhelming; like you will never actually get anywhere. You find yourself in a room, closet, car or office surrounded by stuff asking, “Where do I even start?” Maybe you’ve browsed all the online tips on organizing. Perhaps you considered having a garage sale and then just decided it was too much work for one person. All the excuses made it all just feel impossible. I’m here to tell you that change when it comes to decluttering, it is possible. Yes, it will take time. Yes, it can be overwhelming; but, you can do it. It just takes a little strategy and a few deep breaths. Pick one area to start with. That’s all you have to do. If you’re starting in your bedroom, just start with one drawer. Grab a box for donations and a bag for garbage, open up that PJ drawer and start tossing those jam-jams you won’t be using anymore. In fact, if decluttering is a struggle for you, I say the slower, the better. I have a detailed one week declutter process that really allows you to take your time. This helps avoid feeling overwhelmed and really allows you time to appreciate each space in your room for what it is. If there is that part of you really hoping to make some profit on all these things, are a ton of great ways to re-sale gently used items. Decluttr is an online thrift store option that allows you to calculate certain items like old electronics to see just how much money they are willing to pay you. The best part is, shipping is totally free. Get your items together and send them on their merry way and then cash in! Ultimate Minimalist Spring Cleaning List: Mind, Body, Soul. Ahhh that good ‘ol “What if…” This is something we just all around don’t need in any part of our lives. Spending our time pondering what could have been or what might be is a good waste of the time we have right now. The “what ifs” pop up a lot when it comes to downsizing and decluttering our things. “What if I need it someday?” “What if my aunt comes and I don’t have her vase anymore?” “What if I decide to take up the banjo?” The “what ifs” were probably my biggest struggle. What if I needed that dress someday? What if I wanted to read that book again? I haven’t seen this movie in 8 years, but maybe one day I will want to…” What ifs can be an endless battle. Do yourself a favor and just bail on those items that aren’t being used or have already served their purpose. These what ifs can get real tough when it comes to other people. “What if my mom finds out I gave away that tea set she gave me?” Well folks, I think it’s safe to say that we are not living this life for other people. I think your mom would be just as bummed to find out that you don’t love the tea set, or that you’ve let it go unused. This is a good time to explore options; does your mom want the tea set? Is there an aunt who would cherish it more? Be open and honest about it, and while those conversations might be tough, there is nothing wrong with some open-hearted honesty. 3. I need . . . There are definitely things we need in life. Food, shelter, love, purpose. Yeah, I got a little cheesy, but it’s true. The thing is, all these important things can easily be taken away because we wind up spending our money and time on things we think we need, but actually don’t. Even our life’s purpose can be snatched away from us without us even knowing it. This strong desire of feeling like we need something, whether it be the latest technology, best fashion or a cheeseburger at midnight all come from a deeper feeling of not being complete. Take it from a former shopaholic, consuming things eventually stops bringing joy. You are left with that same empty feeling and a little less money in the bank. But a funny thing happens when you work through the clutter; you have more space to breathe, more time to prioritize your life and you start to figure out just who you really are. You might begin to realize who you have been all along. Clean spaces can literally be life transforming. In fact, I started my own clean space ritual recently. I started making my bed every day. Let me tell you… game changer. You can check out my post all about it: 5 Simple Habits to Help Keep a Clean House Every Day. We don’t always realize just how much damage clutter can do to our day to day lives, but I promise if you take it one step at a time, you will start to see and feel positive change. This post has come at such a good time! I’ve recently decided to start clearing up at home and minimising – space, clothes, etc. It’s crazy how your mood is connected so closely to clutter… and working from home, this is really something I don’t need! Thanks for the tips! I agree (with the working from home) I feel like the entire house has got to be clutter free and cleaned up if I want to have a productive day! Happy decluttering! I have been trying to minimalize for months now and love our hints and tricks! Thank you so much! It is definitely a process! So just don’t stress! For me personally, I think I love stuff too much to be a minimalist, I love the odd pillow,some unwanted and unloved coffeetable. I`sure not a clutter fan but I know some people will consider me having too many unnessesary stuff. Still, a really interesting read, thanks for sharing. 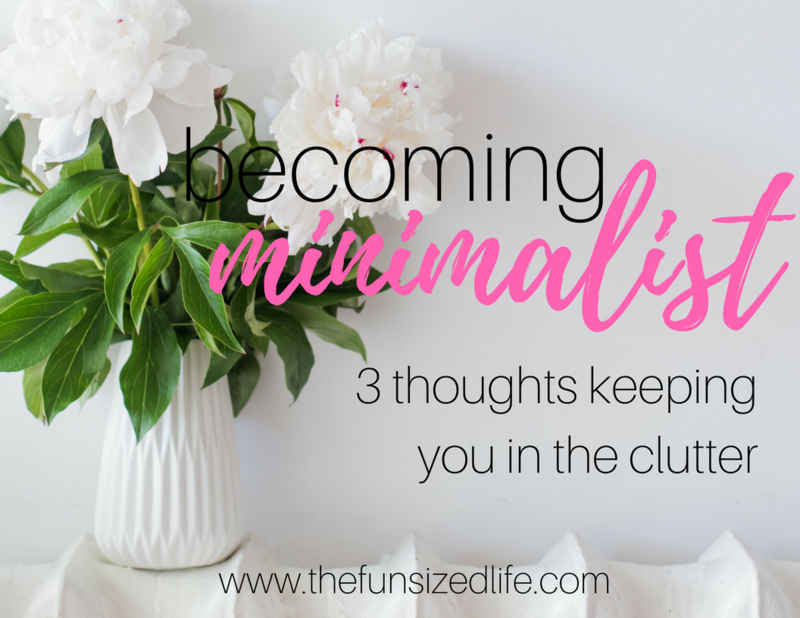 You can absolutely be a minimalist! It’s not about rejecting stuff, it’s about clearing the clutter and making room those those things that really speak to you! I really need to declutter this week and notice I’m currently at the ‘what if’ stage. I’m gonna push through as I know I’ll feel much better once it’s done. YAY! Good luck to you! I know you got this! I swear I declutter every week! This is so helpful! The what-ifs always get me – I always think that as soon as I get rid of something I’ll suddenly need it again. I went through that so much in my life! I started just closing my eyes and letting go. It is tough but so freeing! Great article! Inspiring! How long did it take you to get to where you wanted to be and where you are just maintaining? I kind of feel like it has been a whole life-long accumulation. When we moved into our big house it started catching up with me very quickly. Once we decided to downsize it was very quick and easy. We have been in our smaller house now for over a year and I honestly would not be surprised if at some point we started thinking even smaller. These are some great tips! What if’s are definately the main reason most people delay decluttering. Your post is great motivation for people to start organizing their house and, with that, their life. Thank you so much Irena! I couldn’t agree more. The “what ifs” are something I definitely struggled with since I was a kid!